I hesitated to review this book, but there is no doubt it is a highly contemplated addition to current political hype. 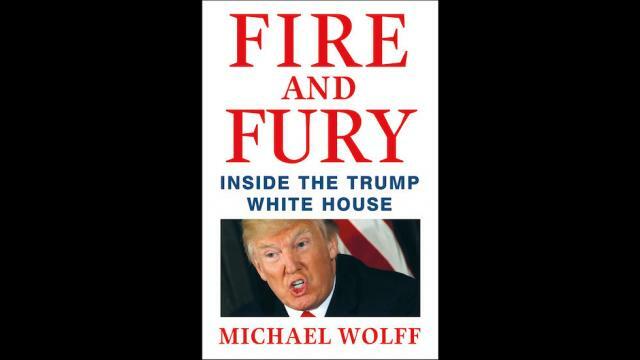 Fire and Fury is written by Michael Wolff, an American author, essayist, and journalist and a regular columnist and contributor to USA Today, The Hollywood Reporter, and the UK edition of GQ. He has received two National Magazine Awards and a Mirror Award and has authored seven books, including a biography of Rupert Murdoch. Murdoch’s scathing descriptions of Trump are in the book. After having written a positive article on Trump, it is said he was able, through Steve Bannon, to get permission to just “hang around” the White House for several months. As strange as this seems, it does appear to have worked just this way. Wolff, given entrance by Steve Bannon, sat on a couch, wandered through offices, overheard conversations, and arranged personal interviews. One reviewer called this “tabloid text”, and I would agree. If you are hoping to read something that puts the final nail in Trump’s coffin, you will be disappointed. In fact, if you are a political junkie, you have probably heard most of it somewhere already. But that doesn’t make it any less titillating. I feel that Luke Harding’s Collusion or Devil’s Bargain, by Joshua Green, are actually more informative. However, after all the media hype, it is worth a look. I am asked, “Do you believe it?” My answer: “Perhaps not every word, but in general – yes.” One gets an inside picture of just what it is like inside the White House during this presidency. It isn’t a pretty picture. The factions are defined with illustrations to further flesh them out. I suppose we have all wondered about a White House full of a President’s family members and here it is spread out before us in all its glory. “Hope Hicks was in fact thought of as Trump’s real daughter, while Ivanka was thought of as his real wife”. Trump is quoted as proudly describing Melania (through others’ recollections), as a “trophy” wife. When right-wing billionaire Bob Mercer shifted his support from Ted Cruz to Trump with a $5 million dollar infusion that came with Kellyanne Conway and Steve Bannon as an added benefit, Trump didn’t resist. But according to Wolff and others that we have read, Trump wanted to be the most famous man in the world, and in fact he actually said this to his on-again off-again aide, Sam Nunberg, at the outset of the campaign. This idea that he didn’t actually want to win is supported well in the text. Trump is quoted as saying “I don’t think about losing because it isn’t losing. We’ve totally won.” Trump had been encouraged by Roger Ailes to start a Trump network, and they saw a great future. Ailes, however, is quoted as subsequently saying that Trump lacked both principles and backbone. Perhaps the most interesting conundrum in the book is Steve Bannon’s exposé. Much of what he says is actually quoted by Wolff, and the result is not an attractive accounting. Bannon, said to have been the man closest to Trump and most able to influence him, throws that relationship to the wind, recounting name calling by staff (a dope, moron, a child, that he couldn’t control himself, that he had no scruples). Quoted, “Everyone, in his or her own way, struggled to express the baldly obvious fact that the president did not know enough, did not know what he didn’t know, did not particularly care, and, to boot, was confident if not serene in his unquestioned certitudes.” Added to that, are scathing remarks about his family, including damning Donald Trump Jr’s meeting with Russians promising dirt on Hillary Clinton as “treasonous.” I’m not imagining them being too close in the future. Is it true? Well “Wolff has spotted the outlines of his target. The broad strokes seem accurate to me”, says, Michael D’Antonio, author of the book, Never Enough: Donald Trump and the Pursuit of Success. The President’s own lies and distortions, familiar features of his leadership style, make it impossible for anyone to rely on him and his aides in a normal way. Nevertheless, because of Fire and Fury’s tabloid style and bizarre process, I believe folks will continue to pick the book apart for accuracy. But does that matter? We know that the Trump White House is a place of intrigue that started with hope and evolved within months into a place where there was literally not one member of the senior staff who could any longer be confident of the premise that they could make it work. Quoting Jonathan Martin for the New York Times, Fire and Fury: Inside the Trump White House has delivered an altogether fitting, if ultimately unsatisfying, book on the chaotic first nine months of President Trump.” This book is not going to get Trump out of office, or lay out a trail for the FBI as the Steel dossier has. It will, however, make a lot of money for Michael Wolff. At the least, people will get their questions answered about Trump’s coiffure.